Again proved that there was no Saffron or Hindu Terrorism as concocted by Congress. Accused set free from false charges. 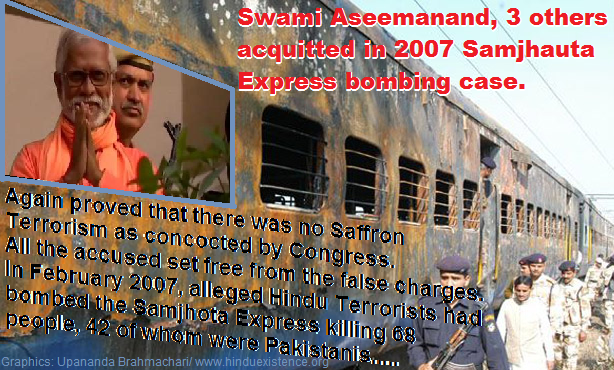 NIA court acquits four suspects including Swami Aseemanand in 2007 Samjhota Express blast case. Upendra Bharti | HENB | New Delhi | March 20, 2019:: After a long 12 years of Judiciary and custodial trail, finally a Panchkula special NIA (National Investigation Agency) court on Wednesday acquitted four people including Swami Aseemanand for the deadly blasts of the Samjhauta Express in 2007. 68 people – 42 of them Pakistani passengers – were killed in the attack when the bi-weekly train, connecting Delhi and Attari at India-Pakistan border in Punjab, on the night of 18 February 2007. Hence, once again it is reiterated that there was no Saffron or Hindu Terrorism as concocted by Congress.as all the presented accused in the instant case are now set free from the false charges. Aseemanand, Lokesh Sharma, Kamal Chauhan and Rajinder Chaudhary have been acquitted by the court,” NIA counsel Rajan Malhotra said, adding that the agency planned to challenge the verdict. Sunil Joshi, the alleged mastermind of the attack, was shot dead near his home in Madhya Pradesh’s Dewas district in December 2007. The three other accused – Ramchandra Kalsangra, Sandeep Dange and Amit – could not be arrested and were declared “proclaimed offenders”. The Samjhauta blast case was the only pending case against the 67-year-old Rastriya Swaymsevak Sangah preacher who had once been accused by the federal anti-terror probe agency, National Investigation Agency, of conspiracy in 2007 bombings at Hyderabad’s Mecca Masjid and Rajasthan’s Ajmer Dargah. Many of Hindutva Organisations had alleged that Swami Aseemanand, Sadhvi Pragya and others had falsely been implicated in the “saffron terror” cases to create a fake balance with jihadi terrorism as part of the “minority appeasement” politics of Congress. From a source it is intercepted that Swami Aseemananda may join in politics and he may contest from any of Lok Sabha seats in WB in 2019 election in BJP ticket. This is unbelievable ! Ten years for doing no crime. Will they get any compensation. ?Swami Aseemanand was working in Gujarat to stop missionary activities . It is obvious missionaries via Soniaji have some part to play. If some Indian Christians were in jail for such a long period, UN human rights will be creating racaus. President trump will be contacting Modi-ji. This entry was posted on March 20, 2019 by hinduexistence in Anti-Hindu, Attack upon Hindus by Congress, Congress & UPA against Hindus, Conspiracy against Hindus, Hindu Saints, There is no Saffron or Hindu Terrorism and tagged 2007 Samjhota Express blast case, Hindu Terrorism concocted by Congress, Kamal Chauhan, Lokesh Sharma, Mecca Masjid Blast, National Investigation Agency, NIA court, Rajasthan’s Ajmer Dargah Blast, Rajinder Chaudhary, Saffron Terrorism concocted by Congress, Swami Aseemanand, Swami Aseemanand & 3 others acquitted.